OVERCOMING HARDSHIP #1: CHRISTIAN, FLEE “WHATEVER IT TAKES TO SURVIVE”!! Glory to God, we begin a new series today titled, “Overcoming Hardship”! The series will present hope and encouragement for believers in these tough times as well as guidelines for pulling through and flourishing. This post, the first in the series, will be followed by others on the dangers of Ponzi schemes, tips on how to survive the hard times and guidelines on how to bloom in spite of the drought. 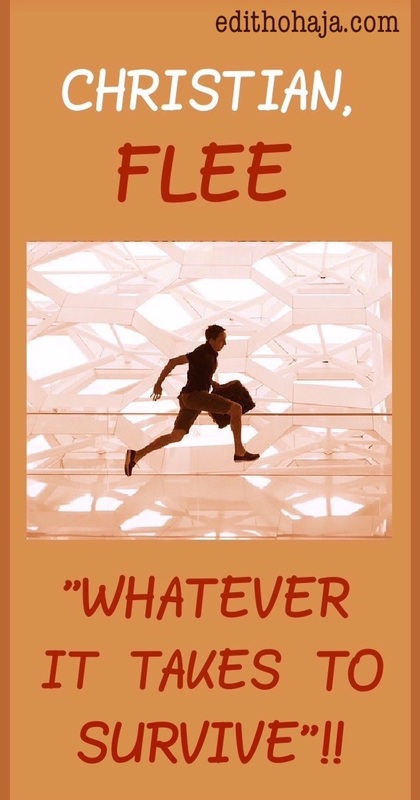 CHRISTIAN, FLEE “WHATEVER IT TAKES TO SURVIVE”!! I want to start by thanking God for His faithfulness upon my life and that of His children everywhere. It’s true that things are biting economically in most countries of the world but we can still see the Lord coming through for us even when it seems that all hope is lost. When things get tough, the temptation to throw caution to the wind and do “whatever it takes to survive” swamps us. We hear stories of people who are doing things that are manifestly wrong and are “prospering” thereby. However, we should resist any pressure put on us to do likewise. Let me rephrase this for emphasis: As children of God, we should not subscribe to the notion of “whatever it takes to survive.” We can survive, praise God, and even thrive without hurting others and bringing a reproach to the name of the Lord. We can do well without adopting the ways of the world. On the other hand, we can bury ourselves deeper into hardship by playing “smart” and cheating others. Whatever is gained by fraud does not last, the Bible says. This is why this is so: Conning people, being dishonest and generally dishonouring God to get by means we are depending on our own wisdom, rather than on providence. This will set God against us and at some point line us up for His punishment when we should be receiving His favour. It’s that serious! “Whatever it takes to survive” is a snare of the devil that could cost one his or her life. When it’s time to face the music, God will probably just watch you suffer. But His faithfulness abounds to those who fear Him and depend on Him. Using good luck charms bought from astrologers, occultists spiritists, etc. God is not unmindful of our situation. He is our shepherd and provider. That is why we call Him Jehovah Jireh. What we need is patience and a willingness to do things His way, rather than heeding the counsel of the world to follow every available means to meet our needs. If you are already caught up in any ungodly economic endearvour, ask God for forgiveness and get out without delay. Even if you have pledged allegiance to the devil or dangerous people in that enterprise, believe God to make a way of escape for you and He will. Bear in mind that you may need to make some restitution. You leave yourself open to attack when you say you’re quitting while hanging on to the proceeds from that wicked activity. Oh, Lord, You are my all in all. Give me the grace to resist every temptation to do wrong in order to survive the hard times upon the earth. Make me an example of honesty, integrity and diligence to the world and bless me abundantly according to Your riches in glory by Christ Jesus. This I pray in Jesus’ name. Amen. Other topics in the series, by God’s grace, will focus on the DANGERS OF PONZI SCHEMES, guidelines for getting by and for prospering in spite of the hard times. It's hard to believe that people are still pouring their scarce cash into these schemes. I guess some are hooked and it's now like gambling to them. Such people fail to listen to the tales of owe from those who have been wrecked by these schemes. Examples of other negative ways to survive includes starting one's own ministry without divine calling from God, engaging in fraudlent practices, kidnapping, blood money or rituals just to make quick money and so on. In this type of situation we should just trust in God and look up to him for help. I guess we can say the list is endless. Thanks for your contributions, Shalom! You are blessed in Jesus' name. Oh, my precious sister, thank you very much. All glory to our loving Father in heaven! You are super blessed forever in Jesus' name. This is indeed a timely message for Christians whose ears still hear. Sometimes I wonder why some so called Christians engage themselves in some of these fraudulent and deceptive businesses without first of all consulting the scriptures or even praying to God to know his will, before venturing into such ungodly businesses. The truth is that the get rich quick syndrome has taken the spiritual lives of many Christians in this end-time as has left them mere professors of the way of the cross and yet remain long ago taken out of the way. I believe every Christian who is sincerely seeking the kingdom of God will retrace their steps back to God after reading this post. Am blessed by this timely words of admonition. More grace to u Ma! Your comment is filled with godly wisdom and thank you for the encouragement. You will certainly excel in Jesus' name. This message came at the right time, because the way i see things going now, if there is no instruction on the direction to take, things will surely breakdown. The funniest part of it is that Christians also engage in these activities just because they think that the economy is bad and that they can't survive it, and the surest way to supposedly survive is by cheating and engaging in these dreadful activities,forgetting that what they are to gain is only ephemeral and useless. Please i beseech you to have a turned heart because time is coming when it will be to late to turn away or even regret your acts. Thank u ma for such an insightful admonition. more grace to your elbow and i hope to read more on this topic. Thank you, Chukwuemeka, and may God have mercy upon us His children. You are lifted in Jesus' name. this message i think is meant for me alone,especially on the psalm 37 where you paraphrased it for me.thank you so much.because that area of fret,thou, yea , shalt etc is throwing many of us the lay men off balance. I'm glad you're blessed by the post. Even the clergy are being distracted by all these wuruwu means of making money as Ononso called them. yes as nonso just called this pattern of making money wuruwuru he is right,ranging from mmm,ultimate circle,sharp naira to bring 5k chop 30k.i mean is greed.for example i gives you, you give somebody,then who gives me.it is on the note of me getting mine is when i collect even yours and theirs.pls everybody should be wiser than eagle,faster than the serpent.i rest my case. It's a sordid business, my dear. By God's grace, I'll take a closer look at it in my next post. Abeg, no go that far oh! Just flee. You are blessed in Jesus' name. Lol! My hand no dey oh! Well said, Frankline! Bless you! 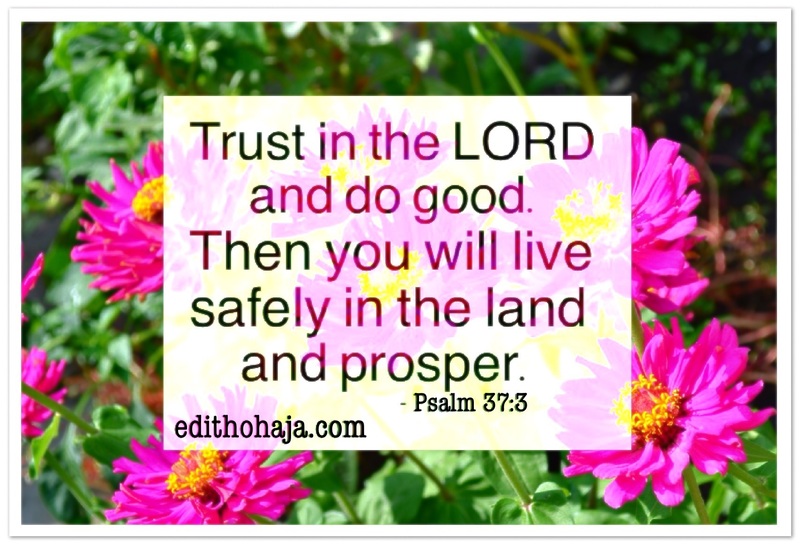 I remember using Psalm 37 in my prayers during the time I worked in Sales/Marketing. The Psalm had all my answers for just about anything I faced in business! Father God is always close and willing to help us. You're right, my sister! If we depend on God, He will see us through. May God's goodness be your portion always in Jesus' name. Ponzi scheme has taught us a lot of lessons. The dwindling economy has made the vast majority of the Nigerian masses to resort to different illicit means of making money. Another example is when individuals start up churches with the aim of issuing fake prophecies and visions in order to get money from people. May God help us all. This reminds of what happened in my church, sometime last year. Shepherds now feed on their own their sheep. I mean pastors, priests and other ministers of God now twist the gospel to suit their desires. They turn the gospel upside down in order to swindle their followers. But they forgot that the gospel of the Lord is a two-edged sword. It cuts from both edges. That is the saddest part when sharp practices are brought into the church. May God deliver us in Jesus' name. Amen and Amen. And, Lord, visit this young man according to his needs in Jesus' name. I totally feel that Christians should stand for what they believe in during hard times and even good times as well. It wouldn't be proper to hurl your christian values to the clouds just because you're going through a difficult situation. In my opinion, it is those christian values you've picked up over the years that will help you make sense of any situation that presents itself and come up with a plan to overcome it. Wise words! Bless you, Ifeanyi! Edith, you are such a blessing! Certainly, in these days there are many schemes and Christians need to be aware. All of the "fake" news is such an example. I am seeing so many otherwise very smart Christians stumble and fall under the grip of fake news. We need to pray, pray, pray! Thanks a whole lot, April. We certainly need to be very vigilant in these last days. Doing everything it takes including bad things to survive is a sheer lack of integrity and dignity on one side and lack of trust in God on the other hand. Right now is the time for us to rely totally upon God. Things may not go as we plan but we'll surely come out stronger, better and refined. Well said, my dear! Things are scary quite alright but God can see us through if we trust in Him. A great beginning to your series. As James tell us, "Every person is tempted when he is drawn away, enticed and baited by his own desire". But he also gives us encouragement when he tells us "BLESSED is the one who perseveres under trial...that person will receive the crown of life..." Look forward to your continuing series. Thanks a whole lot, Mel! I give God praise and pray that we all accept the grace to persevere and receive the crown of life in Jesus' name. Wow dats awesome!!!! wanted to skip dis particular story wen I saw Ponzi scheme cuz I knw it might be sm tin discouraging one from doing it..... Buh i told my sef i must read to the end and I ve actually learnt form it cuz I tot Ponzi scheme is just a game dat depends on hw smart one is buh nw i understand dat it's beyond dat n ve sm spiritual implications. Tnk u Ma for dis wonderful insight and must commend ur effort in d Bible backups. Praise God you read through, Nkemjika! You are favoured in Jesus' name. Excellent post! Thank you Edith for such a complete list of common temptations and sins, but not often thought through or even considered sin. This may change lives! Thank you again! Bless you, Kathleen! It is my prayer that it does. We really need to be the light as the Lord has called us to be. As always, it is s pleasure to read your work, dear Edith! I have another to add to your list: Lying, and slandering an individual's or businesses's reputation, in order to gain their customers. I found your post also stretches beyond the financial; into relationships, where people will often use the same schemes to destroy innocent people's reputations, in order to gain friends or attention. Great post, and I'm looking forward to reading more about the Ponzi schemes! May God continue to bless your words with wisdom, power, and authority in Christ Jesus! Thanks a whole lot, Angela! I say Amen to your prayer and pray that God will cause your own words to go far and wide too, bearing fruit for His kingdom in Jesus' name. Yes, there is hardship in the country but involving yourself in all kind of nasty things would not help. Christians should learn to seek the kingdom of God first and his righteousness and all other things would be added unto them. For the things of this world are vanity. In proverb 23:5, Wilt thou set thine eyes upon that which is not? for riches certainly make themselves wings;they fly away as an eagle towards heaven. That scripture you quoted sounds funny but it's true. Sometimes, you see people who made bad money and were very loud about it living so wretchedly and you wonder, "Where did all the money go?" Well, it grew wings and flew away! Lesson for the wise. Aunty Edith, thanks for this piece. Apart from the spiritual implications posed by these ponzi schemes, they are scam websites that robs peter to pay Paul. Out of ignorance, I fell a victim to one of these schemes and that served as an eye opener to me. Nice piece Aunty Edith. Nigerians really need words of encouragement like this to see them through this perilous reign of hardship under the Buhari led administration. It's a pity, my dear! Just continue with the Lord in faithfulness and use your experience to teach others. God is your Jehovah Jireh in Jesus' name. Well said! I'm glad some Christians like you can come out to say the truth. Many people keep shying away from the truth which is that this ponzi scheme is wrong for Christians. But ma, I have a question, apart from the financial aspect, do you think it's right for one to say "I'll do whatever it takes to stand" in terms of Christian race? If the person means whatever God would have them do, like cutting off wrong associations, enduring persecution and making whatever sacrifices God requires of them, then that is alright. But you cannot please God by doing evil and you cannot be established in righteousness by charting your own course or doing anything that dishonours God. For example, if you punish your body unnecessarily as a means to become holy, that is ascetism and the Bible warns us it has no power to defeat sensual urges. What we need is the grace of God and humble obedience to His precepts from His word and rhema from our communion with His Spirit. Mama, you are more than on point here o. May I add that cheating in an exam hall is part of it. I always tell myself this: "If I should cheat and pass an exam whether by asking someone or by carrying of microchips, the end 'good' results is/are not mine. Simply because I attempted not the questions with my own God-given brain but someone else's brain." So my fellow students take note, when you cheat and pass an exam by hook or by crook, the As and Bs are not authentically yours. Thank you ma for blessing me with this write-up. At least I'm happy that someone higher than I am also understands and shares the same idea as mine. And I'm also convinced that my idea has not been in any way wrong. More grace for greater exploits in writing disciplinary articles. Well done! Thank you for pointing this out, Chet! You will go places in Jesus' name. The introduction of Ponzi schemes( largely as a result of economic meltdown) and their attendant consequencies gives a cause for worry. Most youths have lost their lives. Some have lost huge sums owing to greed abd lack of patience. It hurts to the gall to discover that a reasonable number of individuals who are immersed in these Ponzi schemes are acclaimed Christians. What then is the way out? This question keeps begging for answers. The way out is to retrace their steps in repentance and trust God to bless the legitimate works of their hands. We also need church discipline to be enforced on matters like this. I heard that Apostle Suleiman has pronounced sanctions on any of his members found to be engaging in this. That is what we should be hearing in churches, not teaching Ponzi in Sunday school and endorsing it from the pulpit as it is said to have degenerated to in some cases. Doing whatever it takes to survive can never be the answer. God bless you Ma for this article it is enriching. I have found out that the greatest type of bondange is the freedom to do anything. 'Whatever it takes' permits anithing to make ends meet. This article is also instructive because it tells us the consequences of doing whatever it takes to survive, from Our heavenly father. It has dwelt on God's disposition to ill acquired wealth. This will serve as a guide to all Christians to put their trust in God in trying times and hold firm to His promises. He will never fail. Adigun Temitope (DATI) Peace to you ma! I was under a sermon many years back and the preacher said something that struck my heart. He said: you are a Christian means you are no longer a slave to the world but a slave to the WORD, that is, you are a liberated/free man to the world but must be mindful of the WORD which is heaven. There is one verse in the Holy Bible that says, "in the presence of God, there is liberty". To my observation, many Christians have misunderstand that bible verse to the extent of them thinking that they have liberty to do whatever that pleases and that can be linked to the ponzi schemes discussed above. That is why the Holy Bible says, "God is the God of principles", if you don't follow his principles, then your wrath is coming. Being a Christian doesn't mean that we are totally free from hardship or difficulties, it only means we have grace to stand still in Christ during the difficult time. Spot on, Deacon Adigun! You are blessed! Doing everything to get food on ur table is like worshiping idol and worshipping God hoping if one did not save u the other one will. let us trust God who can do all things for all in due time.he is d only one that can give u permanent peace of mind.what we get from doing evil is transient, euphoric peace which will disappear with time.may God help us. God bless you overwhelmingly, Prince! This is just like the anointing on the Apostle Paul to teach and preach the Word. More grace, man of God! Dear Aunty Edith, you've got a nice piece here. Thank you for bringing this to our attention.Sometimes, i cannot help but ask what the future holds for this generation. A generation where too much emphasis is laid on wealth accumulation. A generation where phones are getting smarter, while individuals are getting dumber. My song everyday though is that God should draw me closer to him and never let me be so desperate as to despise him and go the way of the wicked. Amen. Great song that. Good for consecration. And thank you for that reminder: the Holy Spirit is our Helper. We should never forget that. As in ehhh ponzi schemes everywhere and the worst is Dat dey don't learn their lessons once they lose their money..... Smh... ? #smh too. It's incredible how gullible people can be. ma the verse proverbs 13:11 "dishonest money dwindles away but whoever gathers money little by little makes it grow" is so true, I am a living witness. May the Lord multiply your blessings to make up for what you lost in Jesus' name. Early this year, I heard some people in my lodge saying that "illegal is the new legal" I was shocked at the statement, how can a christian make such statement. I even heard my class mate say that any thing to get him money so far it's not to kill is legal for him.. I was mad..I asked my self is it because of the bad economy, forgetting that as a Christian, temptation must come. We shouldn't fall to it because we are Christians and children of God. "Illegal is the new legal," sounds witty but it is a snare of the devil. Illegal activities have consequences and they are usually far from pleasant. Yes, it's true that we all want to survive but when we don't seek from God the way to do this, it becomes hard dor us to do so and this is where we become misguided by others who we think are making it fast. I pray we all learn to survive through the dictates of God. Your work is saying that it takes more than mere confession of "I am a Christian" to actually be a true Christian. No doubt following Christ is hard because there are so many things that we derive pleasure from that we must do away with and we do this with the help of the Holy Spirit cuz on our own, we can do nothing... Nice one, ma. Well, I mustn't go deep into this unless I start another post altogether because I was dealt with badly. I believe there's something in between this ponzi stuff. Just like a trap, you will be caught, held very tight till either you die or got released. Getting freed is just a mere statement. It is when you have been emptied that your eyes will be widely open to see you are at the verge of Lion's den. Pls! Pls!! Pls!! Any reasonable and responsible human should desist from ponzi. Ma, I really appreciate your countless efforts in making us who have been victimized by this understand the dangers behind it. I pray that God's principles will be our direction. More grace Ma. Fabulous!!! nice piece maam. christians should do their best and leave the rest to God who's the author and finisher of our lives. getting money is not a do or die affair. it shouldn't be whatever- it- takes struggle. just hustle, play smart and pray to God. Doing anything to make money is not supposed to be the language of Christians. We should remember that all these material things perish. Let's work hard to maintain our integrity as Christians. Yes, there are good times and there are bad times. That's what makes one human. One can't have it all good, all the time. When people are having bad times, they should always believe that things can only get better. Desperation should be avoided. Most decisions made by desperate people don't turn out good.